A virtual instrument (VI) is software that takes advantage of your computer's processing power to create and play back sounds. It may be a software recreation, or emulation, of a hardware instrument such as an analog or digital synthesizer, electric piano, organ, or even an acoustic instrument. A VI can also take the form of a sampler. Instead of using dedicated hardware to produce sound, VI software is designed to employ your computer’s CPU. The concept of a VI came from the realization that the sound engine of a hardware digital synth was nothing more than software code and a dedicated mini computer to begin with. Therefore, it wasn’t much of a leap to import that code into a much more powerful computer such as your Mac or PC. Other advantages of using a computer are its greater memory and storage resources. This makes it possible to play back and store huge volumes of samples recorded at higher resolutions. With the advent of synthesizer modeling technology, it was discovered that instead of using hardware, the sound of rare analog synthesizers, organs, electric pianos, and other unique sounding and extremely hard-to-come-by keyboards, could be emulated digitally with astonishing accuracy. However, the digital nature of these virtual instruments, or “soft synths” as they have come to be known, allows them to have features that go far beyond the capabilities of many of the instruments they emulate, such as increased polyphony and improved MIDI control. The term “plug-in” is a generic name for any piece of software that can operate inside another software environment — essentially as a “program within a program.” Plug-ins enable programs such as DAW software to add effects or sounds to their functionality without requiring users to switch to another application. In audio, when we say “plug-in,” we often think of audio processors — that is to say, tools that affect the sound passing through them without producing any sounds of their own. Examples of processor plug-ins are the 1176LN compressor and Pultec EQ found on Universal Audio’s UAD-1 card; vocal processors such as Antares Auto-Tune; as well as guitar effects, amp, and cabinet modeling plug-ins such as Native Instruments Guitar Rig and Waves GTR. While virtual instruments also function as plug-ins, they are sound-generating programs. Depending on the host application, a VI can appear as simply another track (often called an “instrument track”) in your project. It responds to MIDI notes and other control messages, and its output can be recorded as an audio track. There are two primary types of virtual instruments. 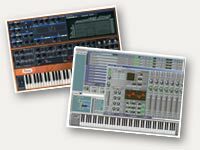 First are sound-generating soft synths such as Arturia’s Prophet V, which employs a sound engine that models its hardware counterpart. Other soft synths, like the MOTU MX4, are new instruments that never existed in hardware form. 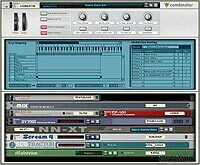 The second category of VI is software samplers, such as Native Instruments Kontakt, MOTU’s MachFive, and TASCAM GigaStudio, which are considered by many to be part of the virtual instrument family. While some software samplers offer the ability to record and edit digital audio data, their most common use is as a playback engine for 3rd-party sound libraries, such as those by Ilio, East West, and Spectrasonics. Since most virtual instruments are cross platform, meaning they will work on either a Mac or PC, choosing a computer becomes a matter of personal preference. On the other hand, there are certain virtual instruments that will make the choice for you. For example, TASCAM’s GigaStudio is Windows-only software. Therefore, it makes sense to go with an audio-optimized PC such as a Sweetwater Creation Station model to run GigaStudio flawlessly out of the box. Since each platform has software specific to it that offers distinct advantages, if your budget allows, it often pays to have both to take advantage of the inherent strengths of each. For example, you might want to dedicate your PC to GigaStudio and your Mac for recording with Digital Performer. Or, you may wish to take advantage of the loop- and music-creation capabilities of Sony ACID Pro, which is Windows software, and mix in Logic on your Mac. Virtual instruments can often operate in one of two modes: either as a plug-in within a compatible host program such as Pro Tools, Logic, Digital Performer, SONAR, or other software DAWs, or in stand-alone mode, which means that the software can be played and programmed without requiring a host program or DAW. Stand-alone mode makes performing live with a VI easier. In either case, while a computer keyboard and mouse can be used to set parameters, a MIDI keyboard controller offers a more musical and intuitive workflow. A controller such as the Novation ReMOTE SL 25 not only adds piano-like keys for musical performance, it also auto-maps its knobs, buttons, and sliders to many software applications, giving you hardware synth-like control. 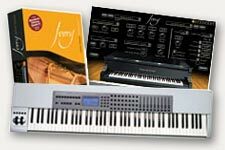 For more pianistic performance, an 88-key hammer-action controller such as the M-Audio Keystation Pro 88 used in concert (so to speak) with a virtual instrument piano, such as Synthogy’s Ivory, will give you both piano-like feel and sound — with the option of functioning directly within a DAW or stand-alone (it’s much easier to carry a 47-lb. keyboard and a laptop with you than a 9-foot Steinway grand). One of the greatest advantages of virtual instruments is the astounding sonic power that you can take advantage of in a live setting. Imagine the ability to take a Hammond B3, a Mellotron, an ARP 2600, a Minimoog, a Fender Rhodes electric piano, a Prophet 5, and a Yamaha DX7, not mention to mention a Steinway Grand to your gigs without having to keep a stable of roadies on retainer. All you need is a laptop, a MIDI controller, and an interface. There are also hardware controllers for virtual instruments that physically emulate certain features of the actual instrument. 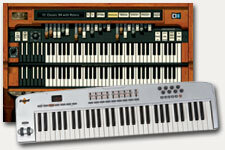 An example would be Native Instruments B4D bundle, which provides an amazingly accurate emulation of a Hammond B3 on the software side, and a hardware controller with nine authentic-feeling drawbars plus knobs and buttons that allow you to control the stops of your organ patch just as you would with an actual Hammond organ. Plus, you can control rotary speaker speed, vibrato/chorus, percussion, recall presets on the fly, and more. Plug-in compatibility can also be expanded via a wrapper, which is software that allows a format to communicate with a different API format. For example, the FXpansion VST to RTAS Wrapper allows VST plug-ins to be used in the Pro Tools LE environment. ReWire is an inter-application communication engine developed by Propellerhead Software. It allows MIDI and audio transfer between two software applications in real time. For example, the audio output of an application such as a soft synth may be routed to another application such as a DAW mixer, and output with the second application's (mixer’s) audio. Further, they may communicate with each other via MIDI so that one can control the other or so they can be synchronized. ReWire currently works with just about every DAW application including Pro Tools, Digital Performer, Logic, SONAR, Live, ACID, and Cubase. Other applications that support ReWire include GigaStudio, Reason, Project5, and many more. Naturally, this is based on your personal preferences. However, it’s always good to have more options than less. If flexibility is what you’re after, look for VIs that offer multiple synth engines. If you’re interested in creating your own unique sounds, choose a VI that either has multiple sound engines, the ability to create your own synths, or an extensive editing section. If you plan on writing music for film, or simply want numerous options for composing and music production, choose a sampler/sample player that offers compatibility with numerous sound libraries. Make sure the sound set of the VI accommodates the musical genre you’re working in. Make sure that the format is compatible with your DAW and your computer’s operating system. Many DAWs can handle more than one format. More than just determining if your virtual instrument works on the Mac or PC platform (or both), certain plug-ins require specific CPU speeds and operating systems. Make sure that your CPU meets the manufacturer’s minimum recommendation for CPU speed as well as operating system compatibility before you buy. VI makers usually state a minimum RAM requirement. We recommend that you have more than the minimum recommended amount of RAM for glitch-free performance. A RAM-hungry VI can easily choke your computer. Look for virtual instruments with RAM-saving features such as Kontakt 2’s purge function, which eliminates unused samples, freeing up more RAM. Also, if you plan on doing larger works such as orchestral sequences, more RAM plus a RAM-efficient sample player will allow more instances of the virtual instrument to play simultaneously. Look for stand-alone operation if you plan on performing live with a virtual synth rig. Stand-alone is also a good feature to have if you would like to use the ReWire capabilities of your existing applications. Otherwise, if you work entirely in a DAW sequencer, a plug-in only format will suffice. Soft synths that are recreations of classic hardware synths often have an interface that resembles the control panel of the synth they are emulating. For other VIs, look for ease of use and the ability to hide and open edit windows to maximize monitor space. A well thought-out means of searching and auditioning sounds from huge sample libraries is a major plus. If you want to tweak your VI’s parameters from a MIDI controller, find out if the plug-in has a “learn” function that makes mapping to your hardware controller easy. Some virtual instruments have onboard as well as downloadable setups for specific hardware controllers - find out if your instrument already maps to your MIDI controller. If you're making a move from hardware to software, a dedicated controller will make the transition a smooth one. Some VI makers also offer dedicated hardware controllers that emulate the interface of the original synth. The more file formats a software sampler can handle the better. This will give you access to a greater variety of sounds and sample libraries from numerous manufacturers. Also, it’s important to find out if it can read the files in your existing sample library, so that you don’t have to replace them. Part of file compatibility is wrapped up in sample rate. For example, you may need your sampler to be able to support 8-, 16-, 24-, or 32-bit WAV or AIFF samples. Most soft synths will provide as much polyphony as your computer’s CPU can handle, sometimes 1,024 voices or even more. Of course, in the case of an emulation of a classic synth, polyphony may be based on the limits of the actual synth itself for the sake of authenticity. 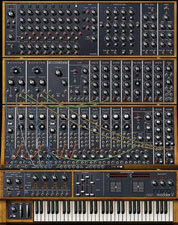 For example, a soft synth emulation of an old analog synth may be monophonic-only. Certain vintage emulations also offer the ability to switch between mono and poly modes. Latency is basically the time that elapses between your finger pressing a key and a sound emerging. Low latency is particularly important for live performance and monitoring while recording. Check to see if the VI’s latency is adjustable. Low-latency settings can be CPU-intensive. You may wish to set your VI latency low for live performance or recording, but higher for playback, in order to prevent RAM-jam on multitrack sequences. Check the manufacturer’s website to see what kind of issues people may be having. See if the manufacturer offers free upgrades and bug fixes on a regular basis. A manufacturer’s web site that has an active forum is a good sign of ongoing support.